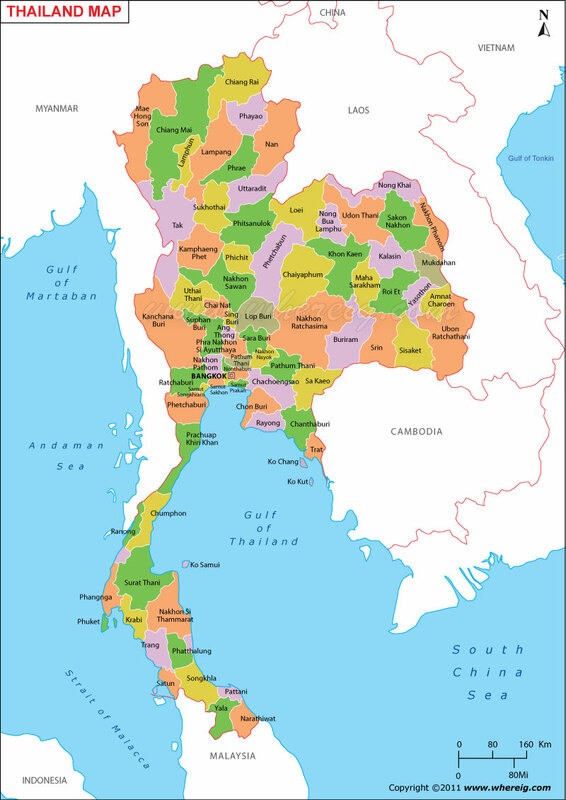 Description: The Political Map of Thailand showing Thailand States, cities, capital, international and state boundaries. Thailand is the 51st largest country in the world, located in Southeastern region of Asia. Thailand shares its border with countries like Myanmar, Laos, Cambodia and Malaysia. Thailand lies between latitudes 5°40' and 20°30' N and longitudes 97°20' and 105°. 45' E. It covers an area of of 514,000 sq km. Bangkok is the Capital of Thailand. Where is Located: located at the centre of the Indochina peninsula in Southeast Asia. Neighboring Countries: Vietnam in the Gulf of Thailand to the southeast, and Indonesia and India in the Andaman Sea to the southwest.